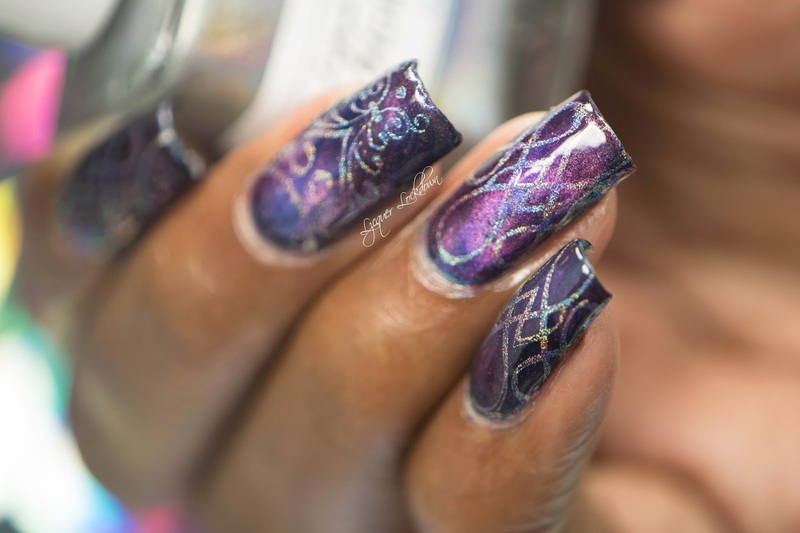 Lacquer Lockdown: Masura Stained Ventian Magnetic Holographic Nail Art + Tutorial! Masura Stained Ventian Magnetic Holographic Nail Art + Tutorial! This is officially ridiculous - I have entered serious territory of the nail gods! 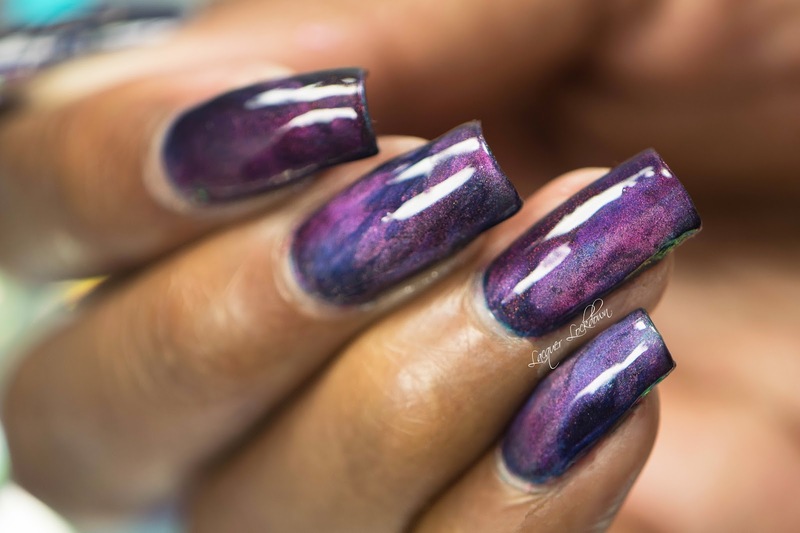 Its a magical place where strong magnetics with magical depth meet supreme the supreme deliciousness of holographic stamping polish and the delicate and awesome imaging of UberChic Beauty. Basically I'm dead. The hype is that real. I almost couldn't bear to take this nail art off after I finished. Holy smokes Batman I'm done I'm done. Ok don't believe me? See for yourself. That moment when you're just like f- yeah and everything lines up perfectly in terms of color story? Yeah that happened here. I know I'm giddy and delirious but ugh! I seriously struggled to remove this one. On a more serious note I also struggled a lot with the design of this mani. Not the stamping but the magnetics. I've been told several times now I make it look easy but it really isn't. It's me playing and playing and figuring out how the colors will marry how the magnet effects the shift and what affect I'm trying to pull out of these polishes. Even with those as brilliant as the Masura's its tough going sometimes. I probably tested combos about 4-5 times and that doesn't include fooling around with the magnet. Btw in my stalking of the Masura brand I've realized they have a new collection coming though I haven't seen it on the website - 7 Wonders Of The World. That sounds decadent and the colors I've seen on their Instagram are divine. I need it and the Magnetic Gradient Collection! Btw since I keep getting asked this despite putting it in my previous post and also in the info box on YouTube I will answer it here again. There is no US based stockist of Masura polish. 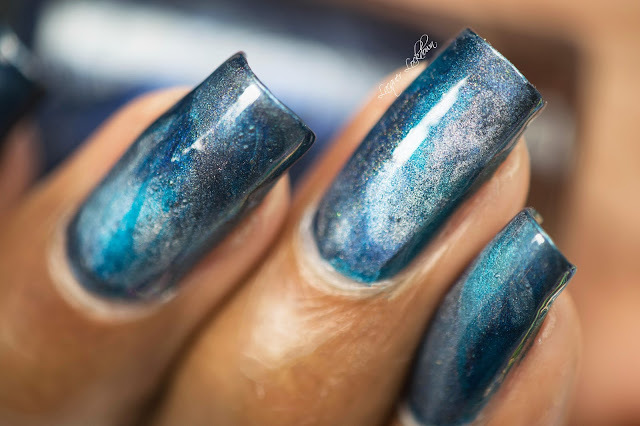 It would probably be frustrating if there were in any case as I can't imagine them stocking enough polish to keep everyone pleased given the overall popularity of these polishes and the wide fan base here in the states. Really they need to do what Dance Legend did and just enable direct shipping from their company to the US. They have a lot of other products I'd love to try but can't because of what offered only by stockists. 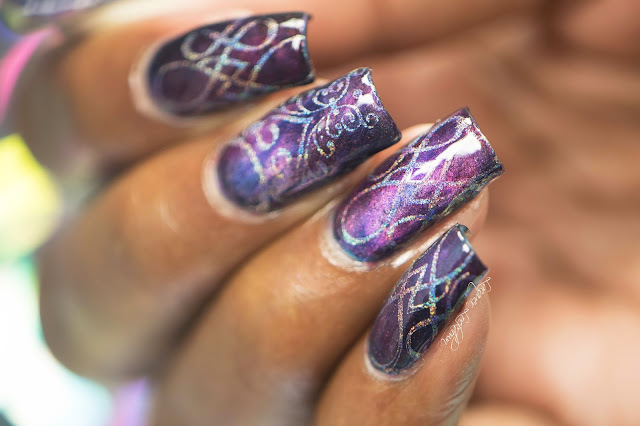 One more shot of these beautiful polishes before the stamping which btw I could have just left alone. 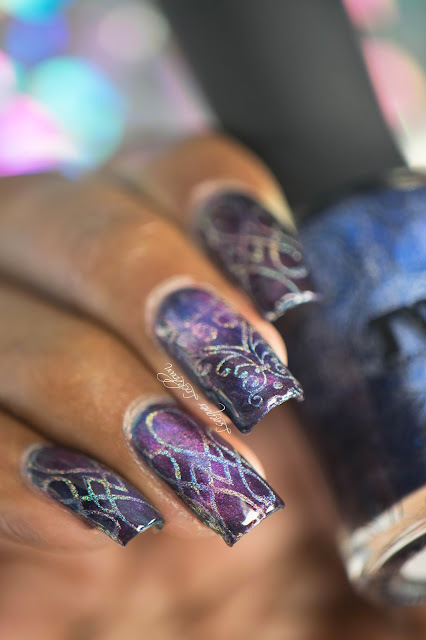 It was beautiful but for once with my magnetics the finished product was even more beautiful because of the stamping! I was twisting my hand this way and that constantly. Oh yeah also if you are wondering what is the deal with the stained glass toppers from Masura. I'm of the opinion they are all together nothing unique. 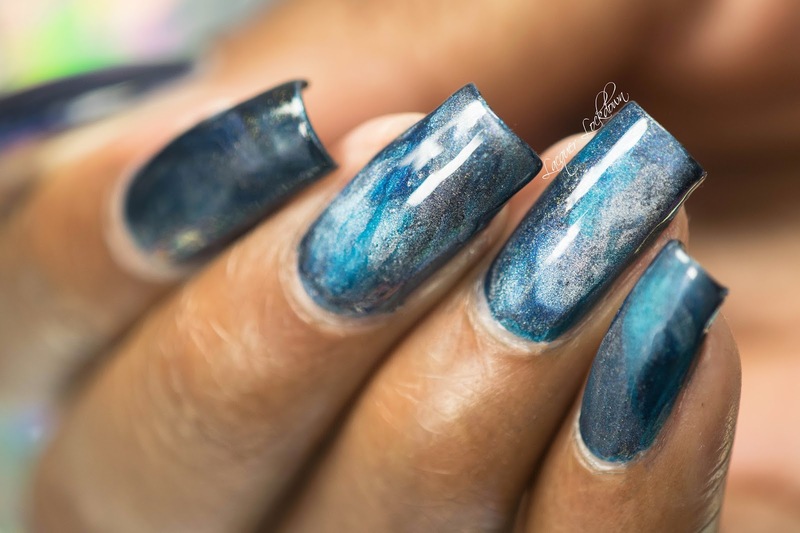 If you have the old OPI Sheer Tints or Color Paints or the Essie sheer tints or any of the leadlight lacquer tints you can create the same effect. The bottles supplied by Masura as tiny and the formulas like the old OPI Sheer Tints is a little thick for my liking. They need thinning but the opacity is intense if you don't which is nice. The effect you get totally depends on the base color you use. So here we are. What do you think? I hope you liked this one as much as I did. I really liked it an obscene amount! I could not stop rocking and angling my hands. 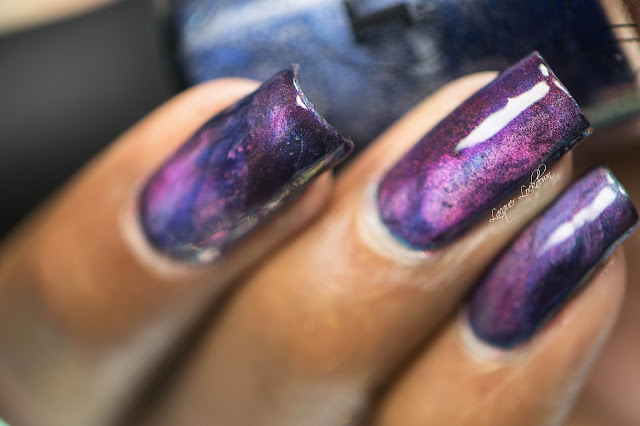 Oh before I go freaking shout out to Liquid Sky Lacquer for the perfection of Holo Opaque. 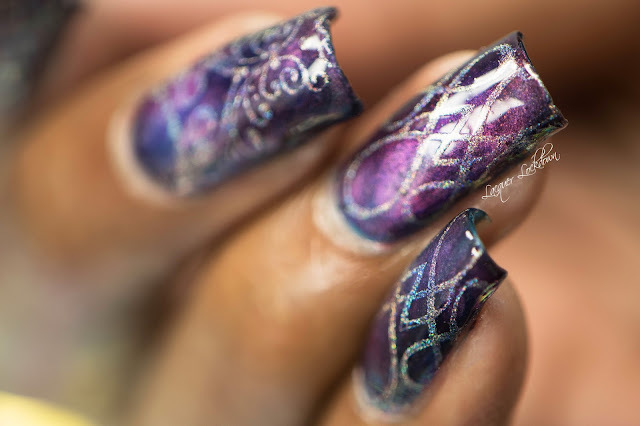 I have other holo stamping polishes but right now this is the one I like the best of all. I need to grab up some backups just in case. Again if you are interested in picking up Masura Polishes from an international stockist that ships to the US you can try either Polish Molish or Hypnotic Polish. 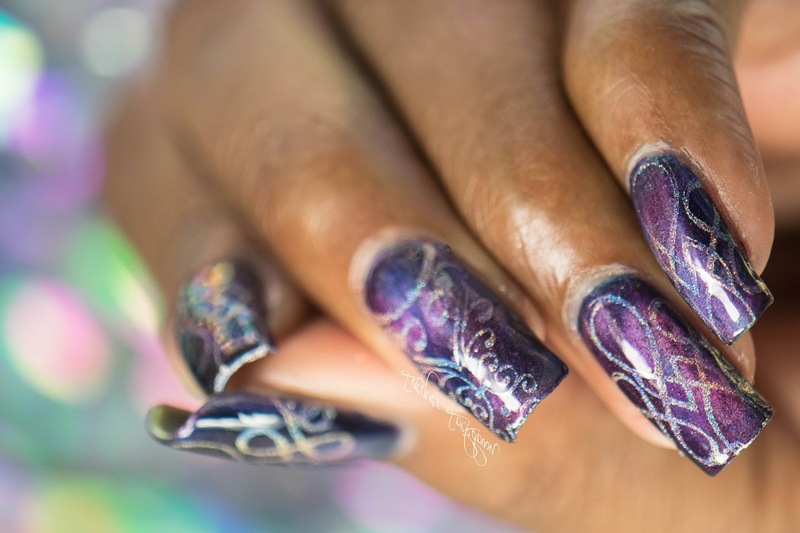 The stamping plates and stamper should obviously be obtained from the super delicious UberChic Beauty brand. Thanks for reading and watching and I'll see you next post!